The Strymon blueSky is an unbelievable reverb pedal. It’s probably the best sounding and most versatile reverb pedal that I’ve used. I only found out about it recently when a friend showed it to me after he got it. I didn’t know anything about Strymon either and I’m glad that I do now. The pedal is a stereo one so it has two ¼” connections for both input and output and is powered by a nine volt power supply. It’s not rackable at all since it’s a stomp box. It’s going to take some time to fully grasp the Strymon blueSky and to learn everything that it has to offer, which is almost endless. Getting basic sounds is easy but to master it will take some time for sure. I’ve only scratched the surface of the pedal myself since I don’t yet own it. The basic parameters that it has to play with include knobs for mix, pre-delay, high damp, low damp, and decay. It also has three different modes and three different reverb types – plate, room, and spring. The modes add a whole level of versatility including the ability to infinitely sustain notes. I would check out the manual if I just bought this pedal. The sound of the Strymon blueSky is some of the smoothest reverb I’ve heard come out of any device. It’s stunning how accurate it sounds and what’s more is its amazing versatility between the three reverb types and modes. It has a certain depth to it that I haven’t heard in any pedals before and only seems to be present in the real deal in things like true plate and spring reverbs. Still, it’s not going to sound like a real plate reverb although it’s damn close. The Strymon blueSky is probably the best sounding reveb unit I’ve used for guitar and is definitely at least in the top three. Sure it’s a pretty penny for a pedal but you’re going to get ultimate control, fidelity, and versatility in your reverb sound. It’s definitely a pro’s pedal but that doesn’t mean others can’t dream about it or at least try it for themselves to see if it’s worth the money. 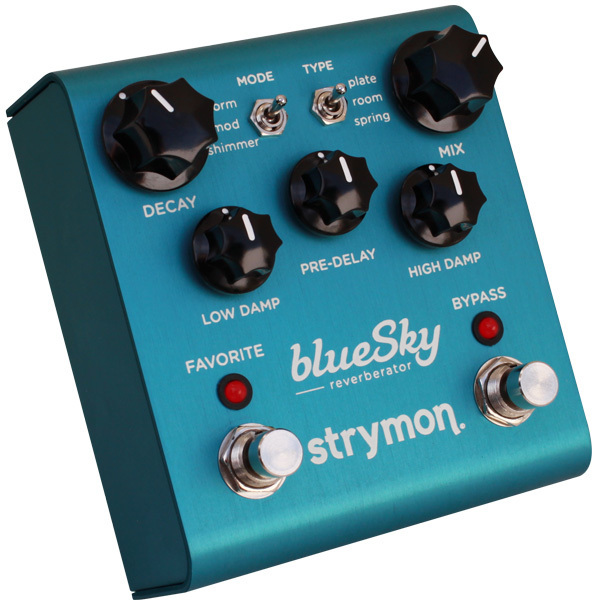 The Strymon Blue Sky Reverb is a digital reverb pedal. It has 1/4 inch inputs and outputs and is not rackable as it is a stomp box. It has ten different types of reverbs and four parameters to control them. It has a wide variety of reverb sounds and easy to use overall. The setup of this pedal is extremely easy, as is getting a good sound out of it. It has five knobs total - one for to choose the type of reverb, one for tone, one for time, one for decay, and one of mix. These controls are basic and manipulating it is quite easy. Some of the types of reverb include hall, chamber, gate, spring, and plate. I don't have a manual for this pedal, but have never had a use to look into getting one. The sound quality of the effects on this pedal are top notch. I have only used this with guitar - usually a Schecter Ultra III and a '76 Fender Twin Reverb. With this set up I am able to get some great reverb from this pedal. Being that it has ten different types of reverb, the pedal has the capability of getting a number of different types of reverb sounds. My favorite reverb on this pedal are the plate and the chamber effects. This is a high quality pedal with a number of very usable reverb sounds. I've been using the Strymon Blue Sky Reverb for two years. I have found it to be an above average reverb pedal because of the overall sound quality and its ability to get a vast number of different types of reverbs. I would compare this pedal to a Boss RV-5, as both have a similar price and overall capabilities. It is hard for me to choose between both pedals, as I think both are great options. 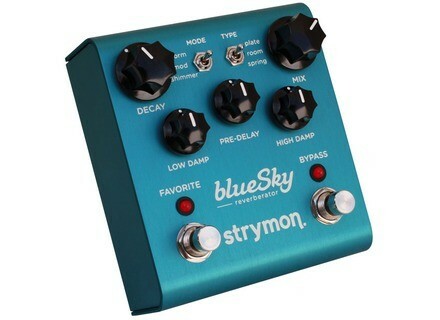 The Strymon Blue Sky Reverb has great tone quality and it won't break the bank. It has a sleek design and its versatility makes it a great all purpose reverb pedal. benderleben's review (This content has been automatically translated from French)" ultimate and compact!" The reverb for those who want to do everything with uncompromising sound. in my custom shop strat is a journey in time and sounds already heard 10,000 times ... the psychoacoustic his account! Reiep's review (This content has been automatically translated from French)" High-end reverb"
Broadly, stereo reverb pedal upscale, true bypass, including 3 types of reverb (room, flat spring) and 3 modes (normal, mod, shimmer). For full features, better visit Strymon, over-inclusive. The pedal is made entirely of aluminum and should withstand the strongest shoes. If you use a power supply at least 200mA DC 9V required (measured by Cioks). The only flaw in my opinion (like all single pedals Strymon): no MIDI to control favorites (preset = 2), activation / deactivation of the pedal and pedal always use a phrase via midi. A true dry kill would have been appreciated too. Very easy to use, there is really a way of carving reverb with onions. Only the Mix knob has a dual function (+ / - 3dB), so it is simpler than the El Capistan from this point of view. The practical Favorite button allows you to save a preset it will be easy to remember in one click. The manual is very explicit but in English, non-English speakers will make an effort. I use the BlueSky with Diezel Hagen mainly to give fullness to my sound when I play alone in smaller volume. I put it in the parallel loop with the mix to 100%, reverb-type room with mod mode. The idea is to have a very subtle reverb, you can almost hear that when the off ... and it works! I use it sometimes in a pop record on clean sounds, this time in the series loop spring or shimmer, each time with excellent results. I'm not a big fan of reverb, but I can every time find the setting I need, is the principal. Settings pre-delay and low / high damp really help sculpt his sound. I stay in a very subtle registry, but those who want "the big reverb that spot" will also be met. Overall, an excellent reverb pedal for demanding users. I my bearings to models TC Electronic or Hardwire, but a great deal has helped me a chopper BlueSky like new at an unbeatable price. It remains an expensive pedal that I can recommend for demanding users reverb. Most casual users of other more affordable models that will make the job very much, which ultimately is my case. This is why I would reiterate a BlueSky if I fall back on a great deal for my use is luxury. Solid sunset's review (This content has been automatically translated from French)" Quite simply the best reverb pedal format"
This is a little-discussed but there's a "little boost" function configurable if needed. -This is digital but then I do not know how they démerdent in Strymon is organic / orgasmic a force! From what I understand the signal coming in is the same as that fate but mixed with reverb. The sound of your shovel is absolutely the worst best preserved completely mystified. I use it with an LP and a tube amp Ibanez TSA 15 H which has no loop to insert the pedal between preap and power. the cup is behind the Tube Screamer board and yet it does it very well. I use it for 6 months because I'll sell my new amp has an integrated reverb. I love everything in there. jusou's review (This content has been automatically translated from French)" WAOW"
Reverb (Room, flat spring in three modes: normal, modulation and shimmer), and true bypass function "Trail", stereo, no edit possible via computer. Manuel nonexistent in the packaging, to download on the internet, but I do not see much utility except for the "Trail" ecological function ... shall we say. Editing sounds and effects is a simplicity that does not rhyme with mediocrity. I was "stuck" with the effects, it's beautiful. use on guitar, try with a keyboard, can be interesting. I love the modulation mode with a room, the decay at 3 o'clock, mix to 13h, 10h to Low damp, damp High to 15h and 11h to pre delay. I just acquired my opinion is not necessarily relevant, but the sounds are remarkable. I do not like the shimmer effect is a matter of taste so subjective, but I prefer a couple POG2 with a delay and a little reverb. • How long have you use it? • Have you tried many other models before buying it? • What is the particular feature you like best and least? - I do not know yet ... nothing! • How would you rate the quality / price? Stratophil's review (This content has been automatically translated from French)" A "must have""
What I like is the ability to choose between true bypass (press off, the effect is off) and buffered (the "tail" of the reverb sound despite the interruption of the effect). The preset allows for two different reverbs under foot: the class! Then there is the slap! The pedal is very transparent, even in buffered bypass. All modes sound perfectly. Personally, I prefer the natural reverb (normal mode). I have a spring (short and clear) and room (long and darker): perfect for the stage! The high-cut and low-cut can sculpt tone. The reverb time is concerned, I love''. Screwed for over a year on my pedalboard, it is not ready to leave. nikkko 3's review (This content has been automatically translated from French)" A MUST"
Type pedal boutique offering 3 types of reverb: flat, room and spring and 3 different modes: normal, modulate (reverb "chorussée") and shimmer. True bypass. Aesthetically very neat (small bluish look great) and a surprising lightness compared to what I have been before (and boss RV3 tc electronic nova reverb). In short, from the first grip, we feel that it has a product out of the ordinary in terms of its design. Remains to be seen on the plan sound. Not complicated at all, subtlety found in the equalization reverb can sound: the damp low two knobs (bass) and high damp (acute) deserve attention and vary the rendering obtained very significantly. Add to bass reverb rather dark or rather treble for a shiny. These three knobs are extremely sensitive and transform obtained as soon as we made the turn a few millimeters, the prerogative of quality pedals! So there Strymon hat! On the sublime matter what research: a conventional reverb (the normal mode) or on the contrary a more surreal tone ideal for creating soundscapes to pink floyd example (with modes "mod" or "shimmer "). Another key point: the true bypass to respect the original grain of your amp. Note also that with the type of room and adjustment decay beyond noon we get a hall reverb (it bothered me that there is not this type of reverb, I am reassured!). More complete as it seems so. This is undoubtedly the reverb pedal the moment, much higher than anything I could have. The class. Only the flint of the same brand that comes out could compete with the best and complete! it seems expensive on paper, but after all it is a little less than two times more expensive than boss rv 5 and 10 times it sounds as I say 100 times better! then the investment is worth it. lament's review (This content has been automatically translated from French)" The Great, the Good of Very Good." Proposed three types of reverb: Plate, Room, Spring, and 3 types of models: Normal, Modulate and Shimmer in all digital very, very good quality, connectivity with True Bypass.Aucune noon or I know anything, just the stereo and c is already very well. Usage is fairly simple, knowing take the time to discover it because there a lot of possibility with BlueSky.Et You are the worst Tube.Pour my part, I got a Twin reverb Reberb (so to misunderstand! ) and Shimmer reverb, (a trick of Bishop) who is in my opinion one of the big highlight of this pedal easily "appelelable" (Look, I make up words!) thanks to Favorite switch, even a small + brand. Very fact, and much more. She entered my board for a little over a year now she is not near to sortir.J 've had some reverb in the hands (or feet) and not least: (EHX: HolyGrail, Boss : RV5, Eventide Space), but I sincerely think that this is one of the best, if not the best, for the use and quality sound, while stereo please, and there This is "Grand" is very "Great". The "Space" is in my opinion the only real rival to the Strymon, but a bit more complicated to use (100 presets anyway), a little colder ( 4.5 degrees -), is a bit more expensive (200 euros). There's not much I like it, it's fluid, warm, efficient (good talkin Reverb) and with the switch Favorite (handy), two for the price of reverbs 2.Bah yes if you talk the price it's true that this is not to Strymon, takes between 250 and 280 in the Family Euros.Mais Strymon I have already : Orbit (Flanger), and Lex (RI) equally successful as the other one. So in conclusion, even if it means making a choice, I remake exactly the same, without hesitation. alpinestar45's review (This content has been automatically translated from French)" a pedal that is worth seeing!" Everything has been said previously. I wanted to have a reverb pedal ultra versatile, being a fan of this, I wanted to have possibility "unlimited", something I've never had with other reverb pedals as well as in at Boss or digitech multi effects even on . I especially took to the effect "shimmer" which seems rather successful. Operation is simple when one masters all combinations of possible sounds. No need for manual because everything is intuitive, one ear will enable to choose the correct sound. The quality is extraordinary effects, some pedals are equivalent. It's really tailored to my use that is hovering sounds with all the pedals I have on hand. I use it with my suhr, my tom anderson and I admit it sounds whatever happens without distorting the sound quality of his guitar. I've had it about a year, it rings of hell, the quality is really unparalleled Strymon (that's why I have 5 pedals brand: timeline, ola, lex, el Capistan and the famous blue sky). It fits really well with my other pedals (Strymon - suhr - area 51). However, its use may be complicated by the number of possibilities, for those looking for a nice reverb without taking the head, it is best to take a pedal with fewer sélecteur.Cependant, if you want a pedal with his really versatile, I advise you. I think the value for money is very good even if the pedal is worth about € 280. This is a big hit but a visit worthwhile. With experience, I would resume without hesitation. Clearly, if you're a fan of reverb, you lean on this model is undoubtedly high performance and a huge qualité.Je did not put 10 in each section because I think even if she is, perfection n does not exist.